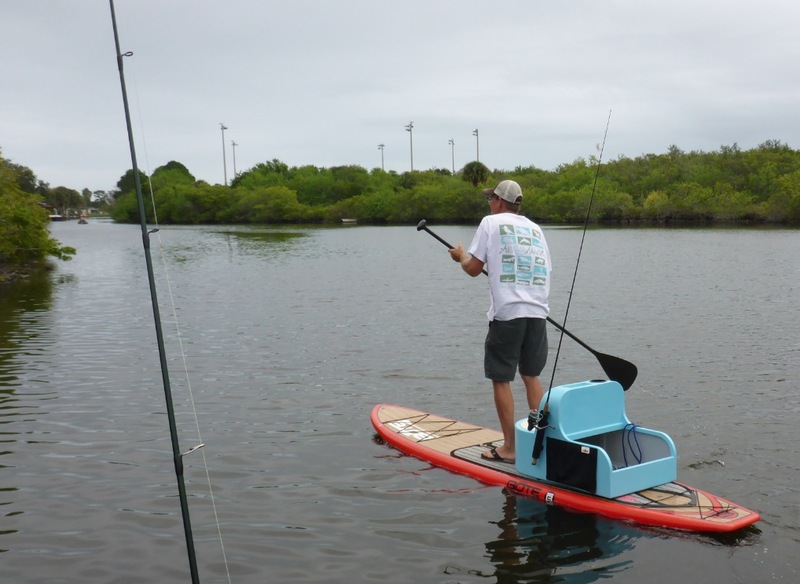 The PaddleFish ™ Patent Pending is the newest trend for fishermen who enjoy paddle board fishing. The ease of adding this SUP seat to your board is one reason for its popularity. Anglers using the Paddlefish™ say it lets them get a higher vantage point when hunting redfish and a place to keep their tackle or live bait. ” 2 easy straps to attach it to your SUP and you are in business.” says Alex Gorichky, local SUP fishing guide. SUP boards, especially BOTE are stealthy and perfect for chasing shallow water redfish. Add a paddle fish and you have all your fishing necessities on your board. SUP paddle fishing has been storming the water way from coast to coast in the last few years. The Paddlefish ™ just seems to be a natural progression to turn your SUP into more. The Paddlefish™ weighs only 18 pounds and is durable, easy to clean and to store. With the base models coming in under $289.00 dollars the Patent Pending PaddleFish ™ is sure to be a hit! Looking for an economical skiff to chase redfish, look no further. The Inshore Power Boat or known to their cult following as the IPB is the perfect skiff and it won’t break your bank. IPB offers up a 100% vacuum infused 16 foot poling skiff rigged with poling platform, 25 HP motor, push pole clips, push pole and a trailer for only $9,900, we think that this is an incredible value. We found the Inshore Power Boat to run smoothly in a light chop, pole effortlessly and we were able to get under 7 inches with 2 people and a full tank of fuel. Redfish are popular sport fish throughout in the United States along the southeast Atlantic and entire Gulf of Mexico. The fact that they are spirited fighters that can attain sizes of over 50 pounds makes them highly sought after by anglers. On November 4, 1984, David Deuel was fishing from the beach in Avon, North Carolina. The outer banks of North Carolina are known for their Fall run of big red drum, but little did David know what would happen next when he set the hook on a redfish that inhaled the mullet he was using for bait. Forty five minutes later he used a two foot gaff to slide the big red drum out of the surf and onto the sand. With a length of 57 inches and a girth of 38, he knew it was big but he was astonished when a certified scale registered 94 lb 2 oz. This one fish had broken both the men’s 80 lb line class and the All-Tackle record. If you think this is great catch, you should also check out all the IGFA line class and fly rod records for red drum. Click here to become a member and have access to IGFA’s entire set of world records and scores of catches such as this one. Redfishing in Louisiana is on fire reports Captain Greg Dini form Fly Water Expeditions. The last 2 trips his charters caught 55 redfish ON FLY! If that is not enough greg tell us this is just the beginning of what is to come, as waters cool larger redfish and black drum will make there way into the Louisiana Marshes to stay warm and feed. If you want to get in on some of this incredible fishing give him a call I’m sure he would love to have you! Enjoy the BEST redfish fishery anywhere with Fly Water Expeditions. Biloxi Marsh, all the way to Venice, Louisiana, Fly Water Expeditions will take you on a red fishing trip of a lifetime. Redfish and black drum are the most sought after species Greg likes to fish for. Some fish exceed 50 pounds, it truly is “The Land of Giants”. Big fish in 1-3 feet of water is where you will find yourself when taking a trip with Fly Water Expeditions. Captain Dini poles around in technical skiffs looking for fish to present a fly or lure to. On an Average day you can expect to catch 4-10 fish when conditions cooperate, and 10-25 fish days are not uncommon including exceptional days over 50 fish. The areas Greg Dini fishes are truly in God’s country and you will rarely see other anglers. During the fall and winter months, Fly Water Expeditions concentrates on the Biloxi Marsh, where the big redfish and black drum come in to feed . The spring and late summer they dedicate their time further south where the breeder redfish get in huge schools preparing for their annual spawn. Greg’s saying is “If the conditions are good and the fish are eating, we aint leaving”. We always strive to put our anglers on as many fish as we can and we will work hard all day long to put you on the redfish or black drum of a life time. Weather you set out to catch a fish on a fly rod and the conditions may not be conducive to fly fishing; we have no problem keeping a spinning rod ready so you have a better opportunity to catch a monster fish. We want our anglers to have a trip to remember when fishing with Fly Water Expeditions, and when you leave you will always want to come back for more! Greg of Fly Water Expeditions looks forward to having you in the boat and putting you on the monster fish of the Louisiana Marsh all day long! Many captains lay claim to the fact they can put you on big redfish, after looking thru Capt. Nathaniel Lemmon’s photo gallery on his website you can see he is not blowing smoke. Capt. Nate specializes in redfishing in the Mosquito lagoon, Florida. If you are looking for a guide in the Mosquito Lagoon area I would give Capt. Nathaniel a call.